Knit every row for 4". End with wrong side row. Knit 8 stitches, bind off center 8 stitches, and knit to end. Knit 8 stitches, cast on 8 stitches over the 8 bound off stitches and knit to the end. 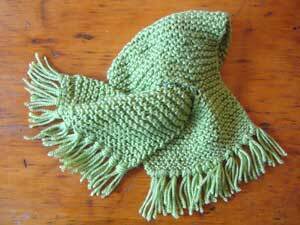 Work in garter stitch until scarf measures 24" bind off. Add fringe to each end. Knit & Crochet for Warm Up America!